Just had the 20mm lowering kit fitted to my Gen 3, low cost to buy and very low cost to fit. I got the ex-Triumph importer (a no-nonsense one-man band, guess why he's not the importer now) to fit it for me while I was at work to save me the hassle. He rides a Tiger 800 and there's a nice feel about having a fellow Triumph owner working on your bike and at a very reasonable cost. I am 6ft but I reckon my inseam is only about 29". Both my feet touch the ground reasonably solidly but not firmly flat. I've has a few heart stoppers off camber or on gravely car parks, first world problem I know! The seat suits me in the high position for the more comfortable seat to peg ratio and although I could have just lowered the seat for the same effect some of the long-distance leg comfort is lost. I really like the outcome in the start & stop of built up areas, much happier. Side stand, no mods at all, still a good lean. Centre-stand use requires extra effort as expected but not too excessive, I will still use it regularly without grief. I would avoid the 40mm kit as that will cause major problems of course. 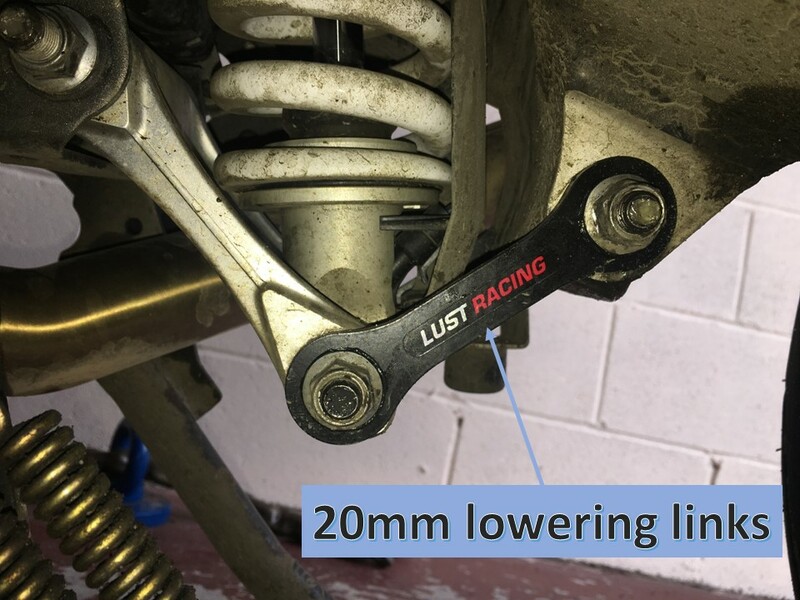 Lust Racing recommend lowering the forks between 12mm-15mm, 12mm for light riders and 15mm for heavier users. If you want to know why they don't recommend lowering the forks by 20mm they will tell you exactly why over the phone, it is based on Triumphs Rake & Trail and how it's measured, they didn't just guess. After having ridden the bike for 40km this afternoon I would go the full 15mm regardless, I think it is very close to stock in terms of handling at that. When I come to sell the bike, it can be put back to stock with ease. I know this item is covered in a few posts, it's where I got the idea, this is just confirming its Gen 3 compatible and a nice solution. This is very interesting. I am 5'10" also with a 29" inseam. I purchased one of the last Gen 2s at a bargain price, about a year ago and had a lowered seat fitted by the Triumph dealer I bought it from. This was just enough to provide me with a bit of confidence but after a couple of unnerving episodes with odd cambers and pot holes etc., I contacted the dealer to ask about having a Lust lowering kit fitted. I was happy to pay them to supply and fit. However they advised me that there was little point as the TSAS would automatically compensate for the lowering and I'd gain very little from it. Also they told me it would detrimentally affect the handling. I have to say these comments flew in the face of several reviews of the kit I'd read, but not being particularly knowledgeable on the science of modern machines I bowed to their views. Also I felt that as they were turning down the opportunity to make a few quid from me they were probably being honest. I've since bought a pair of Daytona motorcycle boots with a heel lift and these plus the lowered seat has made all the difference. I can now put both feet down almost flat and in any given scenario I can find a stable place for at least one foot flat to support the machine safely upright. Over the past year I've become much more confident with it and I've grown to love the bike more than any other I've owned. Every ride is a joy. HOWEVER, having read the previous post I am wondering whether anyone else shares the views of my dealer and if not; what on earth was their motive for not wanting to fit one for me? 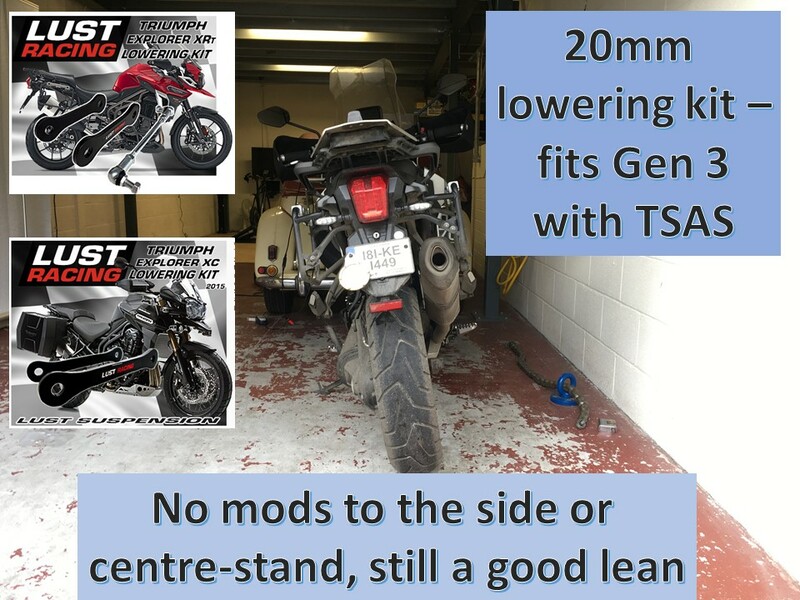 I had a Gen2 with a Lust Lowering kit which included the adjustment bar for the TSAS. 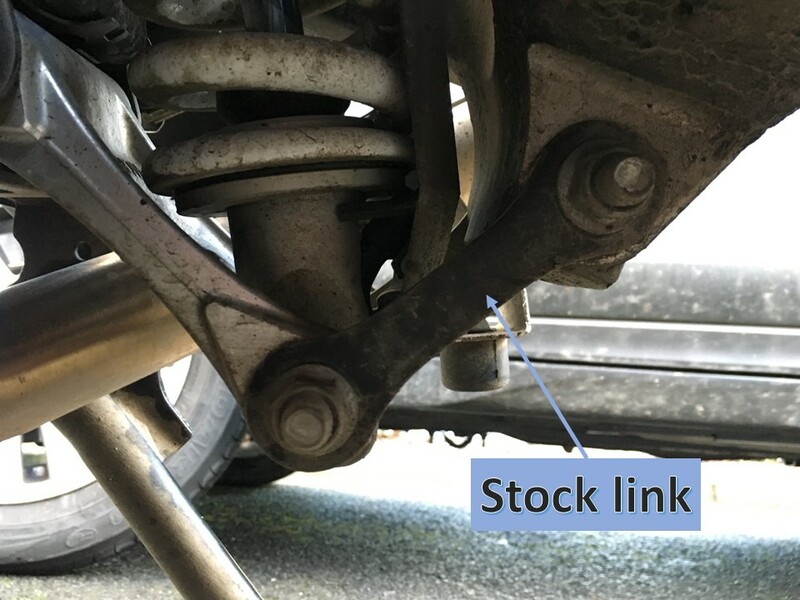 On purchasing My Gen 3 I fitted the Lowering kit, but found that whilst on the side stand the bike sat just a little bit to upright for my liking so reverted back to the stock linkages. I also have a 29" inseam with very muscular thighs and really am on tiptoes with the standard set up. So, I put the lowering kit back on and sent for a side stand for the Low model, which if I remember cost £62, but has the downside of allowing the bike to lean a long way over, which in turn makes it difficult to pick up off the side stand. However I'm sure it won't be to difficult to rectify this. I also lowered the forks 12mm. Overall I'm much happier with the bike with the lowering kit. Slightly more cramped on the legs, but nothing that makes it uncomfortable. I personally feel the bike handles slightly better, but this could well be psychological. As for putting it on the centre stand. It's a bit more difficult, but cane be overcome by running the back wheel up onto a short piece of 4x2 before lifting it on. 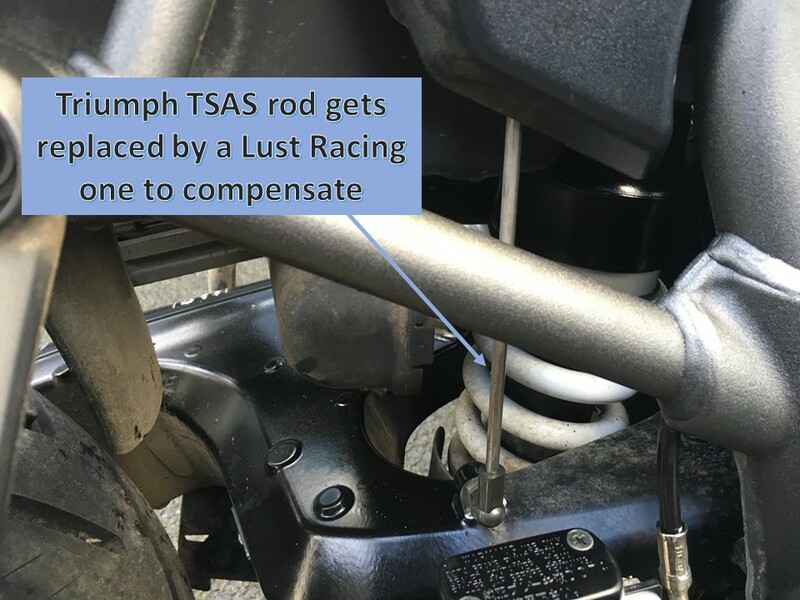 So long as you buy the kit with TSAS adjustment bar, the suspension does not compensate for the lowering and works exactly as it should. your dealer talking rubbish. ive fitted kit with different length bar ,forks through yokes and its fine. you can pop it in off road mode and drop approx. 50mm at rear. Yes, sorry, I should of mentioned the TSAS link rod that comes with the kit. I did take a picture but it wasn't that great, for completeness here it is. The dealer probably just didn't know about the replacement rod when you enquired. 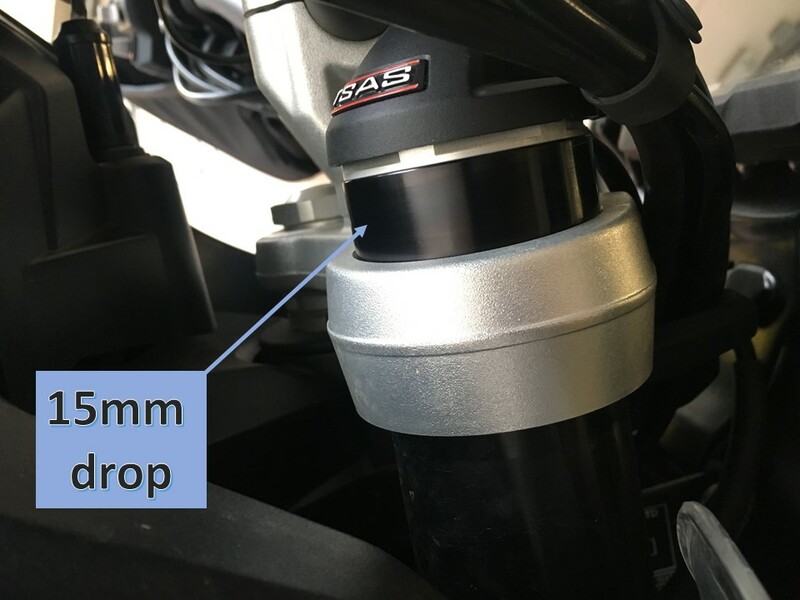 Interesting comments from all, I have a 2017 XCa Explorer and want to lower the bike 20mm - just wondering is it critical to adjust the front forks the 15mm as seems to be to talk? There are the electrical connections on the top of the forks and it looks as though very little slack for the adjustment - has anyone experienced an issue? There was plenty of slack and it was no issue. You must do the front end otherwise it handles very poorly. Just getting the new rear TSAS link a mm out affected my handling too. The instructions tell you to mark the TSAS lever but the 6mm measurement is more accurate. I had no difficulty with the slack in the cables, but the forks needed some persuading the rise through the headstock. I used a wooden drift and a mallet. I wasn't sure about applying some WD4i0 to help it along. Also, fitting upper crash bars affected the handling by putting more weight on the front end, so I went with 12mm drop. 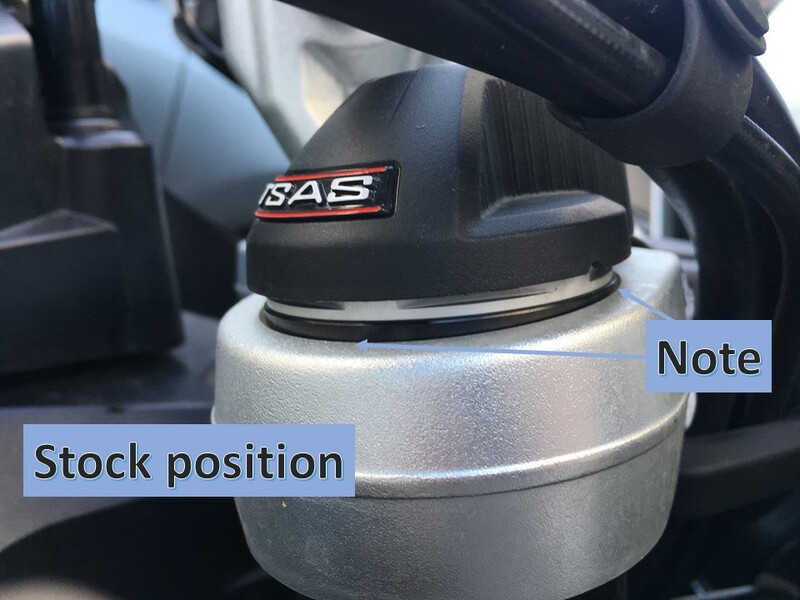 Other replies are correct: the steering wanders a bit without the fork adjustment, particularly two-up.